Snakes alive! For all my Texas readers, the warm February weather has awakened our slithery friends. 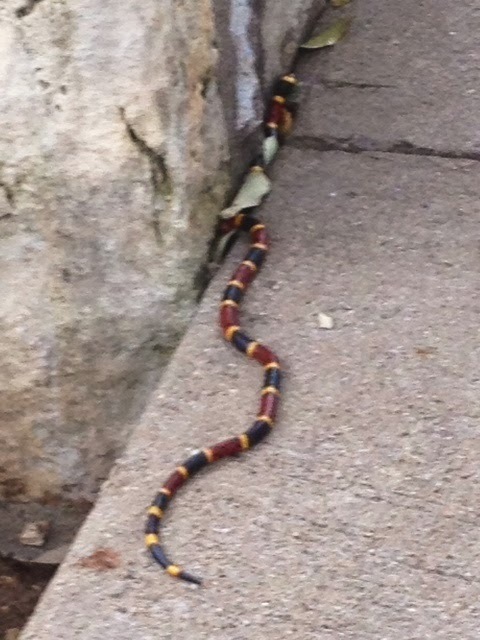 This coral snake was located at River Place Country Club (Austin, TX) on hole #2. Remember this Texas expression to identify this very poisonous coral snake...red touches yellow, kill a fellow...red touches black, friend of Jack. As you can see, the red and yellow bands are touching. Just a friendly reminder, when you go looking for a stray golf ball, always carry a club. Do not reach into high grass, bushes or dead timber with your bare hand! Coral snakes are very colorful, so they are more easily spotted, but rattlesnakes and copperheads blend in to their surroundings. Don't forget about the cotton mouth water moccasin too. They are usually laying around lakes and creeks and can be aggressive. My rule of thumb is "if you can't see your feet, you are in too deep". Take your drop and move on. The U.S.G.A. Rules of Golf allow you to take a drop away from dangerous situations penalty free. Following is a link to help you identify our Texas poisonous snakes. How Well do you Visualize your Golf Shots? What does a goal post have to do with golf? I was an instructor at a golf clinic about 6 years ago and Jackie Burke was the featured speaker. If you don't know about Jackie Burke, I have included links at the bottom of the page which will direct you to articles about Jackie and you will get the idea. He won The Masters in 1956 as well as 16 events on the PGA TOUR. In addition, many PGA TOUR players have sought out his expert wisdom and advice including Phil Mickelson, Hal Sutton, Steve Elkington just to name a few. When Jackie speaks, the pro's listen! As far as aiming, this is what Jackie had to say during the clinic, "man, as far as lining up to the target, I just imagined a goal post between me and the target and I just hit it through the goal post"! Now you know what a goal post has to do with golf. It's all about visualizing your golf shot before you hit it. Sometimes all of us get caught up in swing mechanics and forget the object of the game is to play from point A to point B. 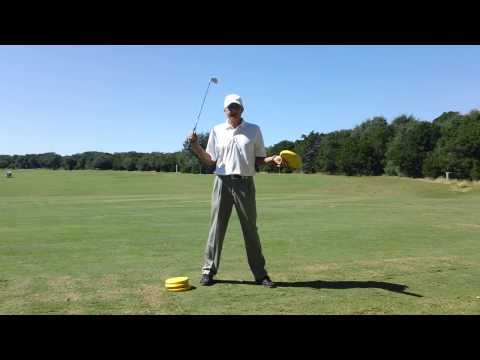 We need to be thinking more of the target and less about the swing during a round of golf. By imagining you are hitting through a goal post, you are projecting your thoughts to the target. In particular, if you are faced with a difficult or scary shot over a hazard, the goal post would gather most of your attention and you wouldn't worry as much about the hazard. 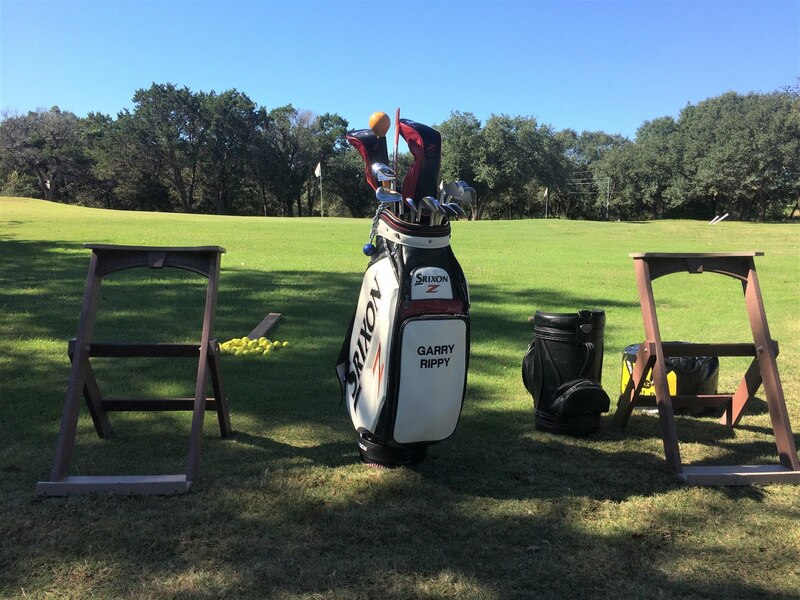 In the Austin Junior Golf Academy we use "Goal Posts" as one of the hitting stations for the juniors. They have so much fun hitting their shots through the goal post and they are learning to visualize at a young age. In addition to "Goal Posts", we have a hitting station called "Picture This". At this station, the juniors (using soft golf balls) are about 5 yards from the obstacle and they have to hit through the window. Focus is on the target which is the tree in the middle of the window. In the picture below from an earlier post, I am demonstrating how you would focus on the target and block out all the distractions. It is very similar to "Picture This" isn't it? All I would need to add is a goal post. Whether you visualize your target, the goal post, the window or a wall, the bottom line is you will free up your golf swing and have a lot less mental stress!